Brian Lamb of C-SPAN wins this year's President's Citation to honor his distinguished career in journalism at the National Press Club's 39th annual NPC Journalism Awards dinner, July 24, 2012. NPC president Theresa Werner presented Mr. Lamb with his award. Distinguished journalists Marie Colvin and Anthony Shadid and freelance photographer Remi Ochlik were honored posthumously with the John Aubuchon Press Freedom Award at the National Press Club for the courageous work covering the Syrian civil war that claimed their lives earlier this year. The journalists were determined to make sure the Syria  story was told, no matter the cost, friends, family and colleagues said. "It was really important to Remi to continue his work,"  Ochlik's longtime girlfriend Emilie Blachere said in a message delivered to the Washington crowd by Delphine Halgand, Washington director of Reporters Without Borders. Blachere said she had no regrets about Ochlik's trip to Syria. "He wanted to describe with his pictures the atrocities of the war in Syria and he was right to want to do this," she said. "I haven't felt like laughing since the day of his death, but this evening, tonight, I will drink to you, Remi." Christina Lamb, U.S. editor of The Sunday Times of London,  recalled fondly her longtime friend and co-worker  Colvin. eye-patch from an earlier war injury. "Marie represented all that was great in journalism. She went everywhere, fearlessly, getting scoops." Lamb also remembered Colvin's lighter side at foreign correspondent gatherings London. "She was invariably late and lost. We always used to laugh how she could manage to do all these amazing things around the world and then couldn't find her way on the London Tube," Lamb said. "She was the bravest journalist I've ever known." Colvin and Ochlik were killed by Syrian military shelling. Shadid's  mother Rhonda attended the dinner with husband, Charles Moschera, who expressed his gratitude for the award given to the two-time Pulitzer Prize- winning   New York Times reporter. Shadid died after suffering an asthma attack while traveling in Syria. seeking his disclosure of an anonymous source for a 2006 book, "State of War." "What it boils down to is whether or not we're going to have independent, aggressive investigative reporting in the United States, whether the government can tell us what we can write about national security or whether we in the press decide what we write about national security," Risen said. National Press Club President Theresa Werner presented the awards and honorable mentions July 24 in categories that included political analysis, media criticism and breaking news. 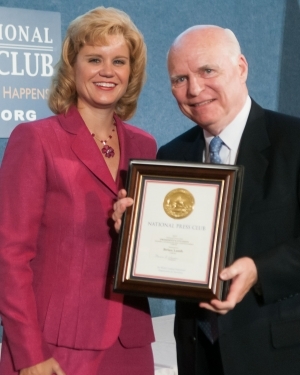 The Presidential Citation went to Brian Lamb, C-Span founder and executive chairman, for his help and longtime friendship with the Press Club. Werner also recognized the NPC Scholarship winners.